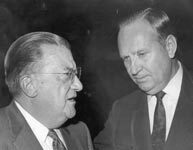 Baseball expansion is approved as Walter O’Malley assisted the efforts of famed singing cowboy Gene Autry, Robert O. Reynolds, Paul A. O’Bryan and associates to bring a new club, the Los Angeles Angels, into the American League. Initially, Autry attended the American League expansion meetings in St. Louis seeking radio rights for his Golden West Broadcasting, but he returned as owner of the Angels. 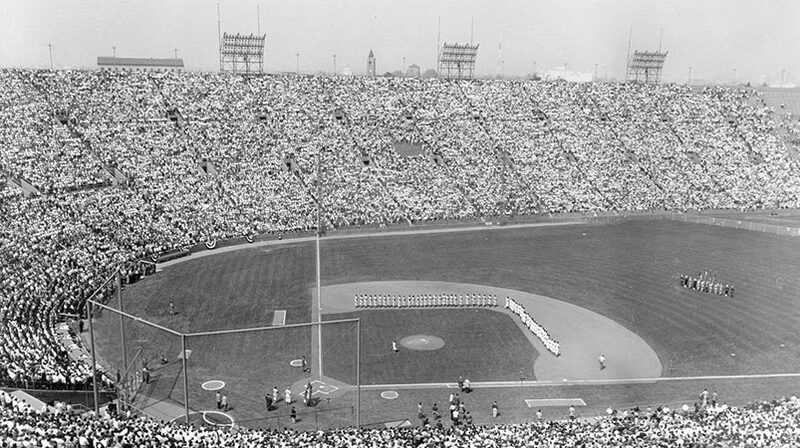 After playing their first year in 1961 at Wrigley Field in Los Angeles, the Angels shared Dodger Stadium with the Dodgers for their respective home games in 1962-65. Wrigley Field had been transferred to the city of Los Angeles by the Dodgers in 1957 as part of the agreement between the parties. A large cartoon of Walter O’Malley graces the cover of The Sporting News. 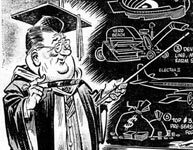 Renowned cartoonist Karl Hubenthal chooses to depict O’Malley as a college professor, complete with cap and gown, pointing to a blackboard and teaching other executives how to operate a successful sports organization. Kay and Walter O’Malley attend the Grand Opening of the Dorothy Chandler Pavilion at The Music Center in Los Angeles. The first performance includes Maestro Zubin Mehta conducting the Los Angeles Philharmonic orchestra with jazz soloist Jascha Heifetz. The Pavilion would be named the Dorothy Chandler Pavilion because of the efforts of the Southern Californian businesswoman and philanthropist to build the performing arts theatre. Walter O’Malley attends memorial services for James Mulvey, former Vice President of the Dodgers and President of Samuel Goldwyn Pictures, Inc. 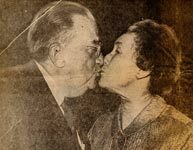 The financier served as long time Dodger Vice President and Director, representing the 25 percent stockholder interests of his wife Dearie McKeever Mulvey, who was the daughter of the late Stephen W. McKeever, former Dodger President from 1933-38 and part-owner. The top Los Angeles Dodger rookie in spring training is annually awarded the James and Dearie Mulvey Award.